Posted by Kim May on July 15, 2011 under DB2 for Linux Unix Windows, DB2 Migrations, Q-Replication. Tags: Q-Replication. 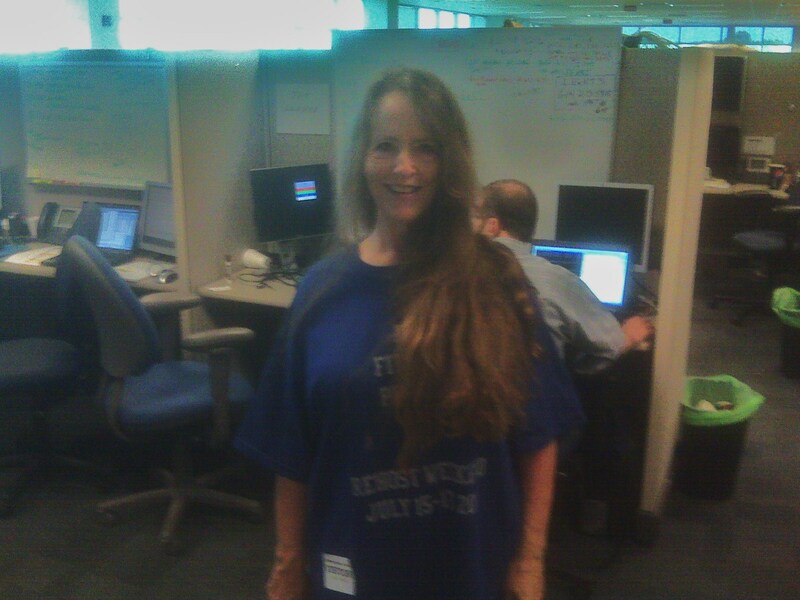 T Shirt Printing Plymouth, full-time security expert and part-time DB2 T-shirt model Rebecca Bond, along with members of the Lab Services and TFG migration teams are working together to complete an Oracle to DB2 migration…here’s to a successful migration weekend!!! Posted by Frank Fillmore on June 16, 2011 under InfoSphere, Q-Replication. Tags: DB2 Homogeneous Replication Feature, Q Replication Dashboard, Q-Replication. On June 9, 2011 IBM released Fixpack 1 of the Q Replication Dashboard v10.1. Cool new features include an Alert Manager that sends e-mail messages when replication thresholds are breached (e.g. end-to-end latency exceeds 30 seconds). After some tire-kicking, I will let you know if this is a viable substitute for the asnmon monitoring feature of Q Replication. The dashboard has also been integrated with Tivoli Enterprise Portal. Posted by Frank Fillmore on May 25, 2011 under InfoSphere, Q-Replication. Tags: DB2 Homogeneous Replication Feature, InfoSphere Replication Server, Q-Replication. Here is another technique to use only when standard practices won’t work. Let’s say you are performing a manual load in Q Replication (either InfoSphere Replication Server or DB2 Homogeneous Replication Feature). Ordinarily you would INSERT a LOADDONE into the IBMQREP_SIGNAL table. The INSERT into the Q Replication Control Table is logged and Q Capture will see it. BUT, what if Q Capture is way behind? Various operational problems could cause this. The manual load has actually completed, but the WebSphere MQ spill queues are growing because Q Apply doesn’t know that. It might take hours for Q Capture to get to the point in the log where the LOADDONE is posted. Wait for the Receive queue to empty. The reason for this is that Q Capture sets an indicator in the message placed on the Send queue specifying that a subscription is still being manually loaded. For each subscription where the LOAD has completed: change the STATE value in the IBMQREP_TARGETS table from ‘E’ to ‘F’ and change the STATE value in the IBMQREP_SUBS table from ‘L’ to ‘A’. Thanks to Christian Zentgraf and Anupama Mahajan of IBM and my TFG colleague, Jim Herrmann, for developing this procedure. Posted by Frank Fillmore on March 23, 2011 under InfoSphere, Q-Replication. Tags: Q-Replication. It’s rare I begin a blog post which will explain how to do something with “DON’T DO IT!”, but I’ll make an exception this time. Read what follows, but don’t do it unless extreme circumstances warrant. A colleague, Jim Herrmann, and I have been working on a Q Replication implementation at a large financial institution. Through a procedural error, we cold started a Q Replication environment, then deleted the schema messages from the WebSphere MQ receive queue that Q Replication had sent from source to target to activate subscriptions. Ooops… We had begun a performance test so there were almost 700k messages added to the receive queue. When we started Q Apply, it complained about missing messages (the schema messages we had deleted). We could have deleted all of the messages and executed another cold start, but that would have required that we re-run the performance test. Due to scheduling constraints, rerunning the test wasn’t an option. We could have activated the subscriptions by re-issuing the CAPSTART command into the IBMQREP_SIGNAL table, but Q Apply wouldn’t see those messages until after the 700k messages were processed. A classic chicken-and-egg problem. What to do? With Q Capture and Q Apply down we manually updated the IBMQREP_TARGETS table. First, we UPDATEd the STATE column to ‘A’ for each subscription. Then, for each subscription we matched the SUB_ID in the target to the source. For example, for SUBNAME MY_TAB_0001, we updated the SUB_ID in IBMQREP_TARGETS to the value found in IBMQREP_SUBS. Next we had to modify the IBMQREP_TRG_COLS table. This update relied on the fact that we had a QA environment that almost matched the performance environment. Jim drafted some nifty SQL to create the necessary DML code. Then we ran the resulting UPDATE statements against the target Q Replication Control Table database. Finally, Q Apply relies on WebSphere MQ for assured delivery of messages – including the schema messages we had inadvertently obliterated. The following message was posted in both the Q Replication log and the IBMQREP_APPLYTRACE table. ASN7551E “Q Apply” : “ASN” : “BR00000” : The Q Apply program detected a gap in message numbers on receive queue “SERVER1.CUSTDB.RECEIVE.DATAQ” (replication queue map “DB2S_TO_DB2T”). It read message ID “515245504D875D2C00000000000000000000000000000019”, but expected to find message ID “515245504D875D2C00000000000000000000000000000001”. The Q Apply program cannot process any messages until it finds the expected message. We had to tell Q Apply to ignore the missing messages. To do this, we added a message to the IBMQREP_DONEMSG table. Then we started Q Apply. This was a work-around in a tight spot. Not business as usual. Posted by Frank Fillmore on March 9, 2011 under InfoSphere, Netezza, Q-Replication. Tags: data warehousing, Netezza, Q-Replication, SQL Replication. By now you’ve probably heard that IBM has acquired Netezza. So how do I get my data into the darn thing? We’ve worked a lot with IBM change data capture technologies: SQL Replication, Q Replication, and InfoSphere Change Data Capture (ICDC). We also work with InfoSphere Warehouse, IBM’s internally developed data warehousing platform. Usually we use one of the former to feed the latter. As changes occur in a transactional database, the deltas are shipped near-real-time to the target data warehouse. There might be some transformation, cleansing, or other manipulation (that’s the “T” in “ETL”) for which we would use DataStage, but a (surprisingly large) number of customers just copy data to the reporting and analysis platform with little massaging. Enter Netezza. The usual “drip-feed” (i.e. as soon as it changes in the source, send it to and update the target) methods listed above don’t play as well. Netezza is optimized for bulk data loading. One-row-at-a-time INSERT/UPDATE/DELETE propagation by a replication technology isn’t efficient. The solution is to create intermediate mini-bulk delimited files that can be ingested, say, every five minutes. There are a couple of ways to create these files. One is to use InfoSphere Data Event Publisher (EP). Think of EP as Q Replication without the Apply component that posts the deltas to a target database. EP can publish XML or delimited files. Viola! Our Netezza problem is solved. If you need complex business rules applied to transform the data, use ICDC or Q Replication to feed DataStage and have it created the delimited files. Posted by Frank Fillmore on March 9, 2011 under DB2 for Linux Unix Windows, DB2 for z/OS, InfoSphere, Q-Replication. Tags: DB2, Q-Replication. Led Zeppelin had a concert film, song, and album with the title “The Song Remains the Same”. Even though it comes in different packaging, Q Replication functionality remains consistent. Data interoperability – what IBM calls Information Integration – is a core competency of The Fillmore Group. We deliver consulting services and IBM authorized training for software products like Information Server (think DataStage), InfoSphere Change Data Capture (ne’e DataMirror), InfoSphere Federation Server, and more. Clear? Good. If not, drop me a note (frank.fillmore@thefillmoregroup.com) to talk about your specific replication use case. Posted by Kim May on January 5, 2011 under Authorized Training Partner, DB2 Education, Q-Replication. Tags: Authorized Training Partner, DB2 Education, DB2 Skills, DB2 Training, High Availability, Infosphere Training, Q-Replication. Valentine’s Day! What could be more fitting if you need to learn to LOVE InfoSphere Q Replication? In honor of St. Valentine’s Day students attending class will receive a box of Godiva Valentine chocolates. If you use Q Replication and have not attended any formal training this class will give you an understanding of how Q Rep works, how to make changes, and how to ensure your monitoring is 100% functional. The outline and registration are on the IBM Learning Services website. I hope you will join us! Posted by Kim May on December 28, 2010 under DB2 for Linux Unix Windows, DB2 Migrations, Optim, Q-Replication. Tags: AESE, Compression, Optim Performance Manager, Q-Replication, Storage Optimization Feature. Posted by Kim May on November 5, 2010 under DB2 for Linux Unix Windows, IBM DB2 Services, InfoSphere, Optim, Q-Replication, Uncategorized. Tags: Add new tag, DB2 Advanced Enterprise Server Edition, High Availability, InfoSphere, InfoSphere Replication Server, LUW, Optim, Q-Replication. Frank Fillmore will deliver a one hour presentation to explain the new DB2 for LUW Advanced Enterprise Server Edition (AESE) packaging – what’s included, how AESE differs from DB2 Enterprise Server Edition and most importantly, why anyone running DB2 for LUW should give AESE serious consideration. To register, click here. If you have a problem registering or have questions, email Blaire Crowley (blaire.crowley@thefillmoregroup.com).